For M classes, w1,w2,...,wM, and a feature vector x one can form M conditional or a posteriori probabilities P(wi|x), i=1,...,M, which represent the probablilities that x belongs to class wi. In the case of equality the pattern can be assigned to either of the classes. An example of two regions, R1 and R2 for the cases of two equiprobable (P(w1)=P(w2)) and classes is shown in the figure below. The variation of p(x|wi), i=1,2, is shown as a function of x. The x0 is a threshold which divides the space into two regions. 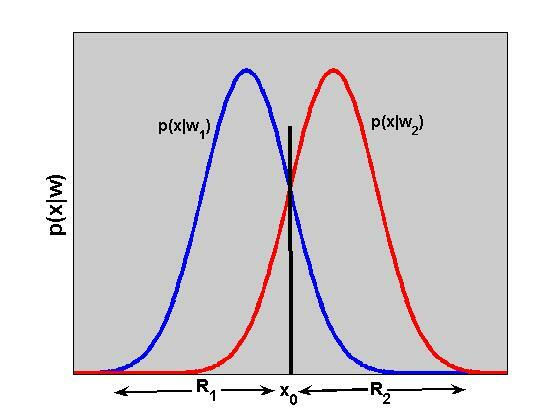 According to the Bayes decision rule, the x is classified to w1 for all those values of x in R1. The Bayesian classifier minimizes the classification error probability. However, the classification error probability may not always be the optimal criterion to be adopted for minimization. In some cases some errors may have more serious effects than the others. In those cases the use of a penalty term to weigh each error should be considered.